A minor criminal offense that happened 20 years earlier could prevent someone from getting a job or finding an apartment if a criminal background check shows past arrest and conviction records. Through the Expungement Law Project at Rutgers University–Camden, some Camden-area residents with low income are receiving help to navigate New Jersey’s cumbersome expungement process and clear their records, providing an opportunity for them to restart their lives as equal citizens in society. The obstacles to expungement are many. Criminal records can be expunged for some offenses but there are limits as to the number of offenses and types. Some people try to file a petition for expungement without an attorney, but the daunting process often causes many to give up. Locating a complete criminal record can be challenging because a New Jersey State Police fingerprint report may not include all of a person’s criminal history. Fingerprint reports contain only charges or arrests for which someone is fingerprinted. Expungement petitions with errors or missing information may be rejected, requiring the individual to file again. “Now, you may have to pay a filing fee again, postage to serve it on state and local agencies again, and your hearing is going to be delayed another two months or six months, depending on how far out the court may be scheduling hearings,” says Schalick. While helping petitioners search for information, the Rutgers Law students occasionally find unknown charges. Regardless of whether a conviction ever occurred, even a charge such as someone filing a local municipal charge of simple assault could still be listed as an arrest on a permanent criminal record. “You don’t know about it and 10 years later you want to apply for a promotion at work and this charge comes up on your history,” says Schalick. Second-year Rutgers Law student Lauren Puglisi needed to reach out to four agencies to locate all of the records for one of her clients. To track down the client’s records, she made phone calls to numerous offices over several days and had to stand in line at courthouses to find out that her client’s offense had been downgraded and ended up in a lower court, and that the probation fee was paid to a different agency. 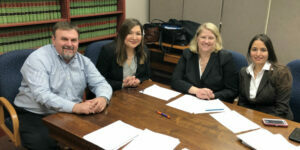 Since the Expungement Law Project began in the spring 2018 semester, Rutgers–Camden law students have provided information to more than 200 people looking to expunge their records. They have filed petitions for 22 clients, with 10 granted expungements by New Jersey Superior Court so far. This semester, more than 150 people have attended Rutgers Law School’s expungement informational sessions on the Rutgers University‒Camden campus. “It’s rewarding to know that I can help a person who needs help, and that because of my legal education I’m able to offer expertise to somebody who is trying to improve their life,” says Puglisi. The expungement experience has inspired the students to consider offering suggestions for legislative reforms to make it easier to find criminal records. 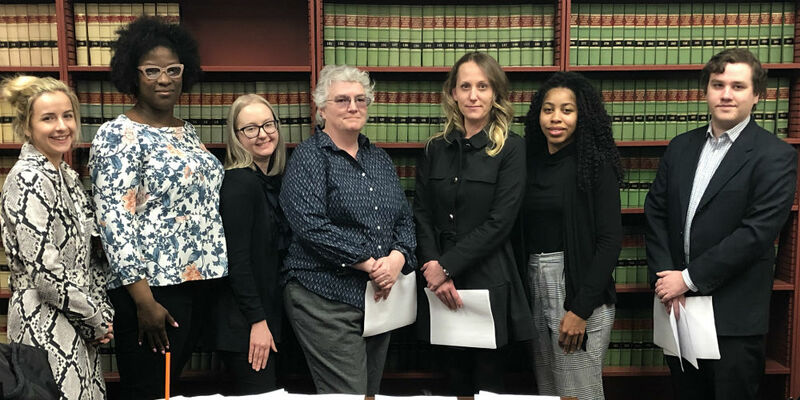 With expungement becoming a hot topic as elected officials consider legalization of adult use of cannabis, Schalick and her students met with legislators and staff in Trenton to discuss possible legislative reforms to make the expungement process easier to navigate.